And they look PERFECT! but at the bottom of the page it says "Clear corner lights are illegal in most states. Please be advised: these lights will come with the amber reflector on the corner." What. what does this mean? They're $55 and i dont want to take a gamble and receive regular corner lights.. why would they advertise them as crystal clear corner lights if they have the amber reflector? has anyone ordered these? or does anyone know of anywhere else i can get clear corner lights? thank you. If by corner lights you mean blinkers. By law most states say they must be amber. My 98 has clear but amber reflector is inside. 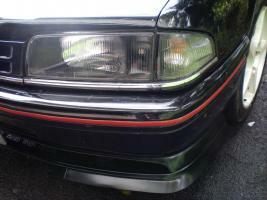 I mean like the corner lights where our blinkers are, i want a non amber reflector, like a white/clear one. i could just use an amber bulb. the clear lense would look much cleaner in my opinion. Get some orange bulbs, take the reflector out? As long as its amber (the bulb) It's legal. I know this is my GD but its exactly what I did.